Tigers are the largest of the big cat species. 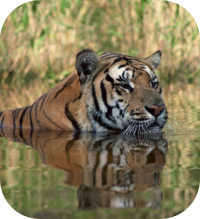 Habitat: Tigers are currently found in Asia, from India to the Russian Far East. 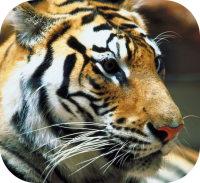 Tigers inhabit areas with forest cover, water, and plentiful prey, these habitats can be tropical rainforests, oak forests, evergreen forests, woodlands, mangrove swamps, grasslands savannahs, and rocky country. 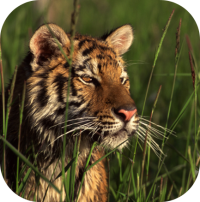 Tiger Species: There are currently nine subspecies of tiger, sadly three of which are now classified as extinct. Size: Male tigers are larger than their female counterparts. Tigers are approximately 3-3.5 feet at the shoulder, they measure 4.6 - 9.2 feet in length with a 2-3 feet tail. 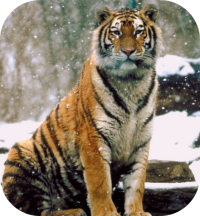 The Siberian Tiger is the largest tiger subspecies weighing between 400-675 lbs. 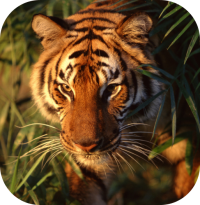 The Sumatran Tiger, is the smallest living tiger subspecies, weighing 220-310 lbs. Tigers are nocturnal hunting from dusk to dawn. They hunt by stalking their prey, and pouncing. 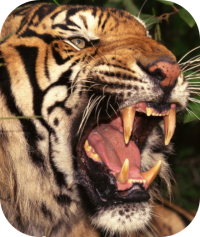 Tigers will eat 33-40 lbs of meat per day. 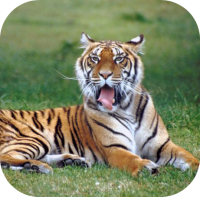 Description: Tigers have a silky reddish-orange with dark stripes, the stripes act as camoflauge. 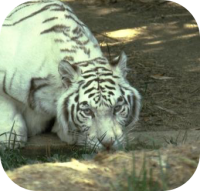 Tigers less frequently can be also be black with tan stripes, all white (albino), or white and w tan stripes. Tigers have long retractable claws. Behavior: Tigers are territorial and will use their claws to scratch the trees in their territory. Birth: Tigers give birth to litters of 2-3 cubs at a time. The cubs are born blind and helpless. 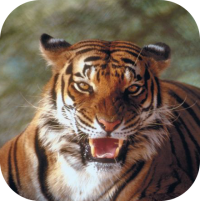 A tiger is successful only once in ten to 20 hunts. Gestation: Tigers carry their young 100 to 112 days, for 100 to 112 days. Cubs: Tiger cubs weigh approximately 2 lbs at birth. Tiger cubs will nurse up until 6 months of age, and they will stay with their mother up until the age of 2. 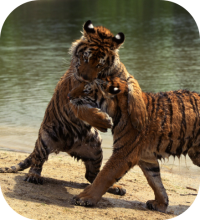 Tiger cubs have a high mortality rate, it is estimated that only half of the cubs survive. A tiger's stripes are like fingerprints, all tigers have a unique striping pattern. Sexual Maturity: Tigers are considered sexually mature between the ages of 3 to 6. Life Span: Tigers live approximately 10-15 years in the wild. Tigers will live 20-25 years in captivity. Social Structure: Tigers are solitary with the exception of a mother rearing young. Athleticism: Tigers are athletic and agile able to stalk and attack large prey. Conservation Status: Endangered and 3 species are extinct. Population Status: There are an estimated 3,000-4,500 exist in the wild today.